We are passionate about bringing you the highest quality and most fashionable garments and accessories that make you feel beautiful, girly and stylish. • Enjoy all the warmth and fashion without any of the uncomfortable bulk. These socks are so comfortable to wear! 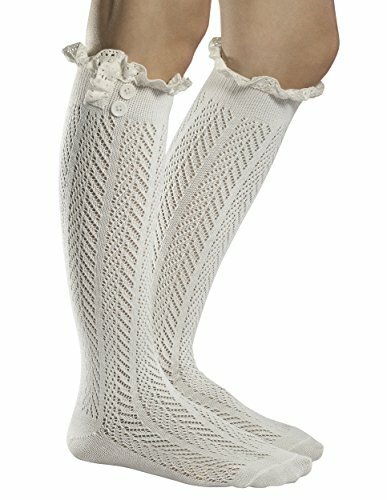 Fiorelle Boutique's knee high socks are the most popular trend of this season's fashion. Enjoy wearing the most comfortable and stylish socks while receiving lots and lots of compliments! We are so confident that you will absolutely love the way you look and feel in our socks, that, if you are, for whatever reason, not 100% fully satisfied, we will offer you a full 30 day money back guarantee with no questions asked! This current pricing is for a limited time and supply only. Click the yellow Buy Now button at the top of this page to get this season's most popular style of knee high boot socks! Our selections are selling fast, so be sure to get yours while supplies last. If you have any questions about this product by Fiorelle Boutique, contact us by completing and submitting the form below. If you are looking for a specif part number, please include it with your message.